Vocabulary 1 Q2 context. 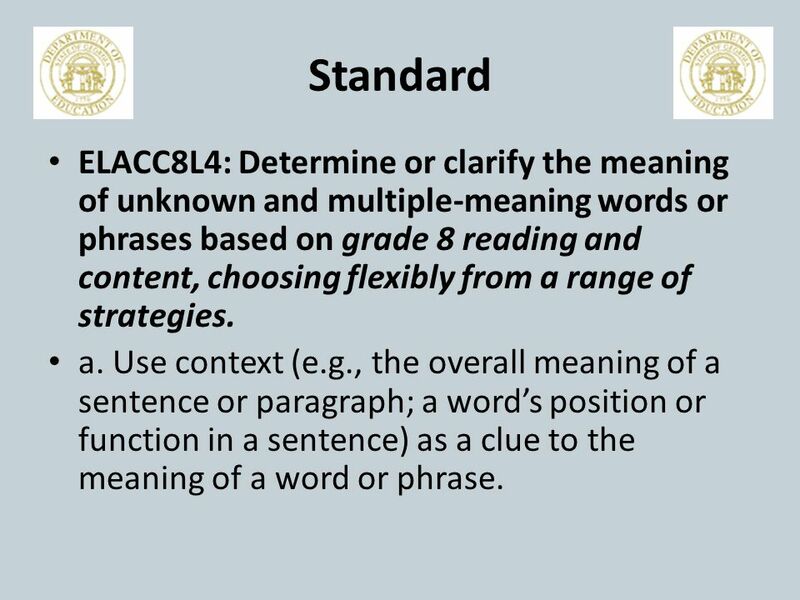 Standard ELACC8L4: Determine or clarify the meaning of unknown and multiple-meaning words or phrases based on grade 8 reading. 2 Standard ELACC8L4: Determine or clarify the meaning of unknown and multiple-meaning words or phrases based on grade 8 reading and content, choosing flexibly from a range of strategies. a. Use context (e.g., the overall meaning of a sentence or paragraph; a word’s position or function in a sentence) as a clue to the meaning of a word or phrase. 3 1. 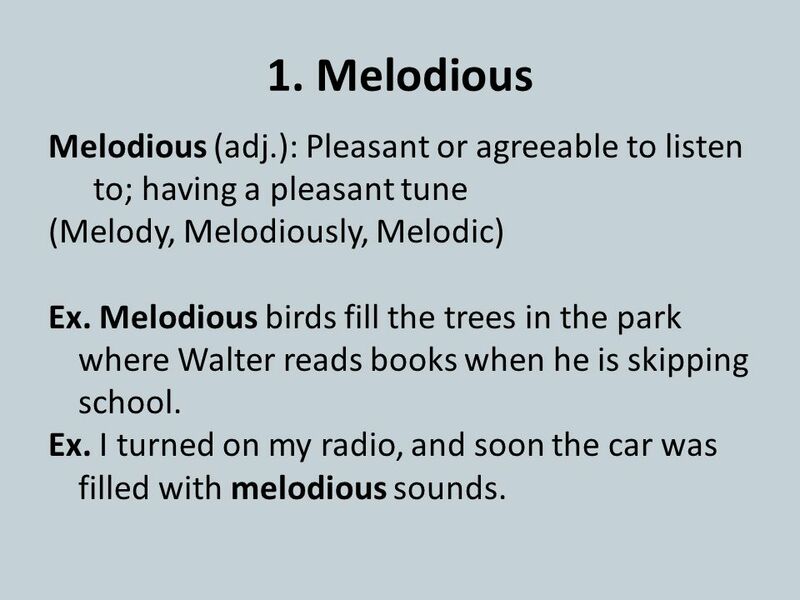 Melodious Melodious (adj. ): Pleasant or agreeable to listen to; having a pleasant tune (Melody, Melodiously, Melodic) Ex. Melodious birds fill the trees in the park where Walter reads books when he is skipping school. Ex. I turned on my radio, and soon the car was filled with melodious sounds. 4 2. Tranquility Tranquility (n.): Calmness; peacefulness (Tranquil, Tranquilize, Tranquilizer) Ex. 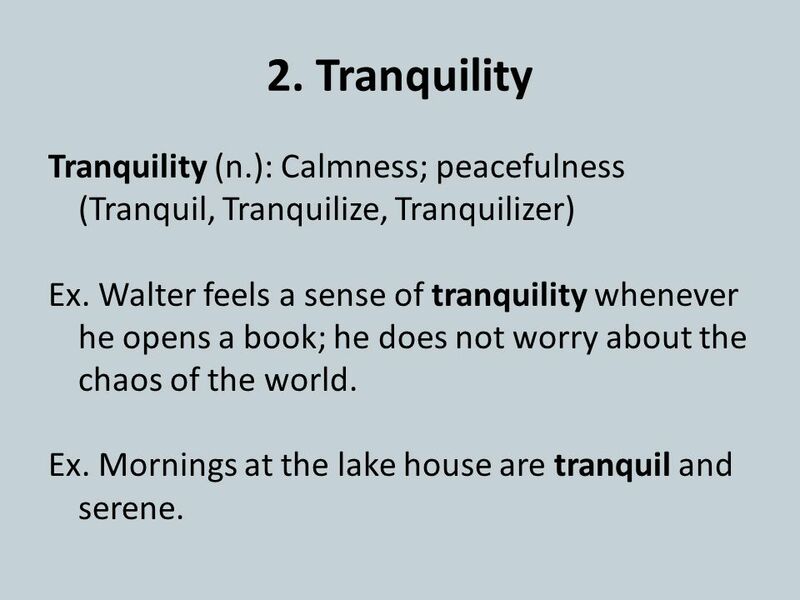 Walter feels a sense of tranquility whenever he opens a book; he does not worry about the chaos of the world. Ex. Mornings at the lake house are tranquil and serene. 5 3. 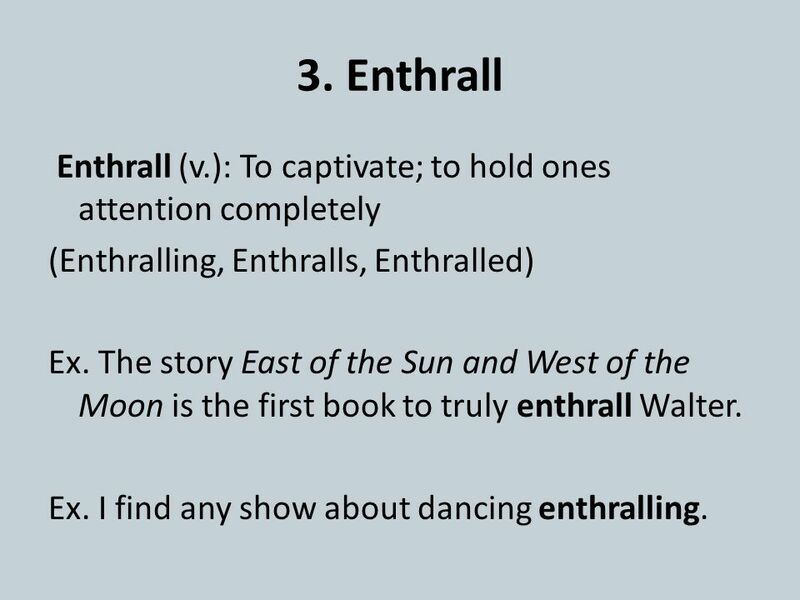 Enthrall Enthrall (v.): To captivate; to hold ones attention completely (Enthralling, Enthralls, Enthralled) Ex. The story East of the Sun and West of the Moon is the first book to truly enthrall Walter. Ex. I find any show about dancing enthralling. 6 4. 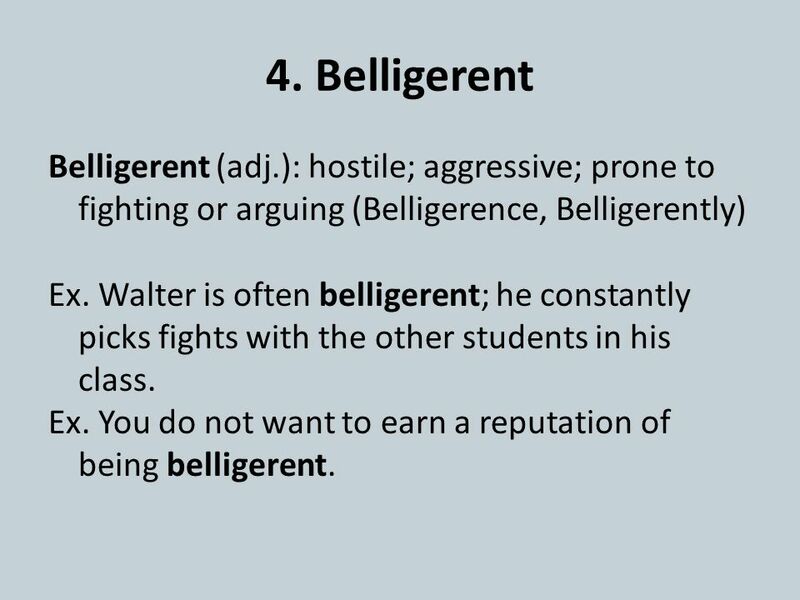 Belligerent Belligerent (adj. ): hostile; aggressive; prone to fighting or arguing (Belligerence, Belligerently) Ex. Walter is often belligerent; he constantly picks fights with the other students in his class. Ex. You do not want to earn a reputation of being belligerent. 7 5. Vex 4. 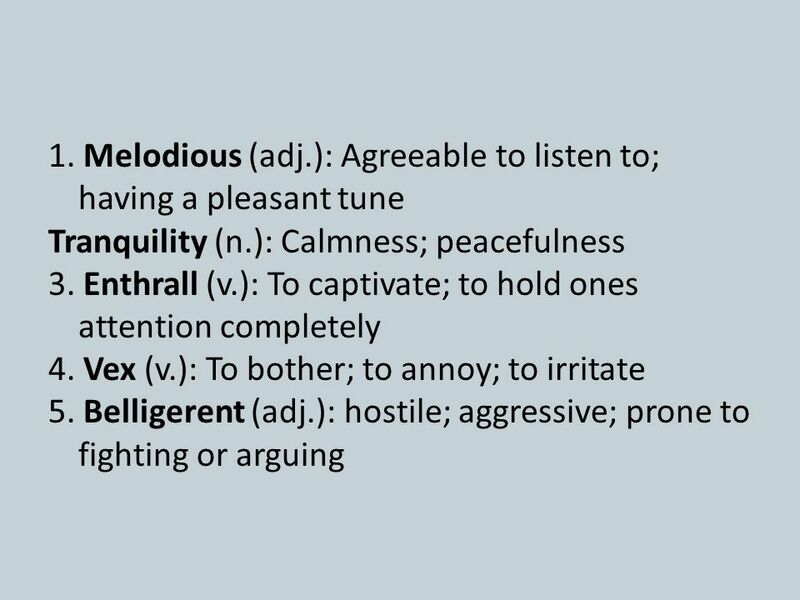 Vex (v.): To bother; to annoy; to irritate (Vex, Vexation, Vexing, Vexed) Ex. Walter’s classmates continually comment on his poor speech, and the cruel remarks vex him. Ex. 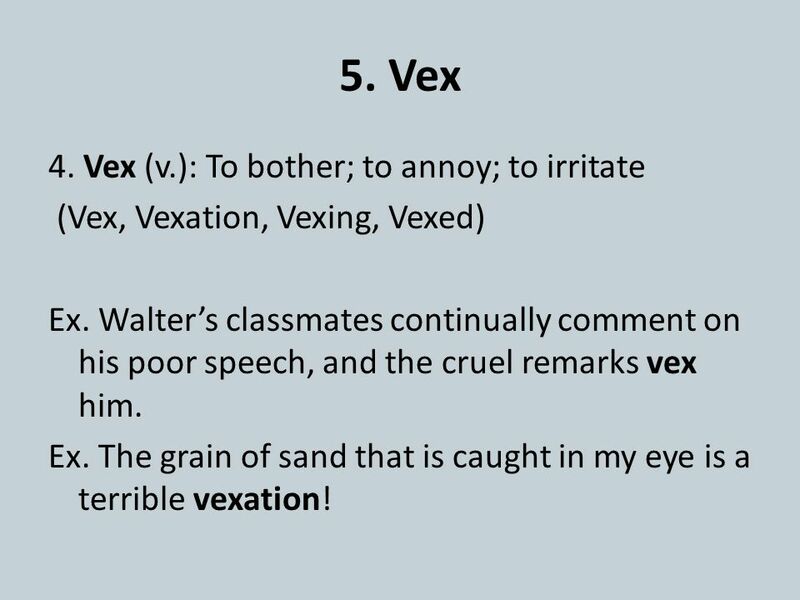 The grain of sand that is caught in my eye is a terrible vexation! 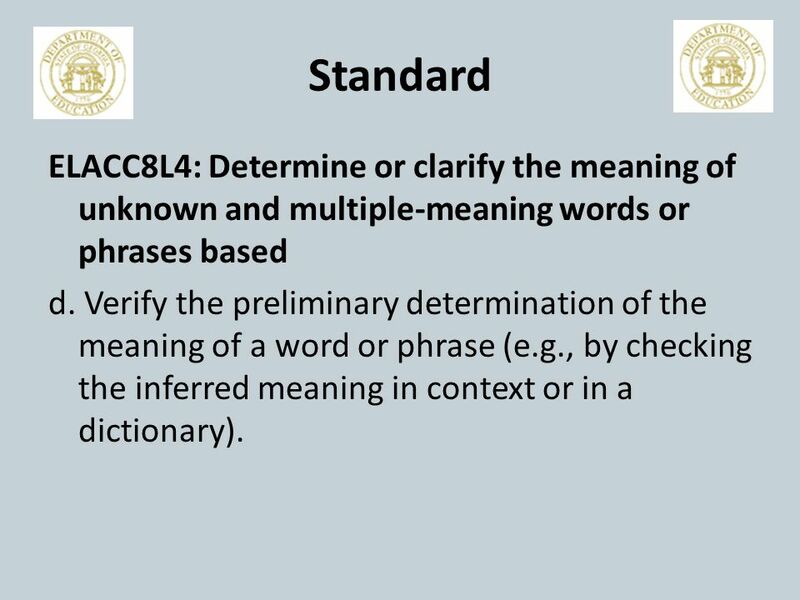 9 Standard ELACC8L4: Determine or clarify the meaning of unknown and multiple-meaning words or phrases based d. Verify the preliminary determination of the meaning of a word or phrase (e.g., by checking the inferred meaning in context or in a dictionary). 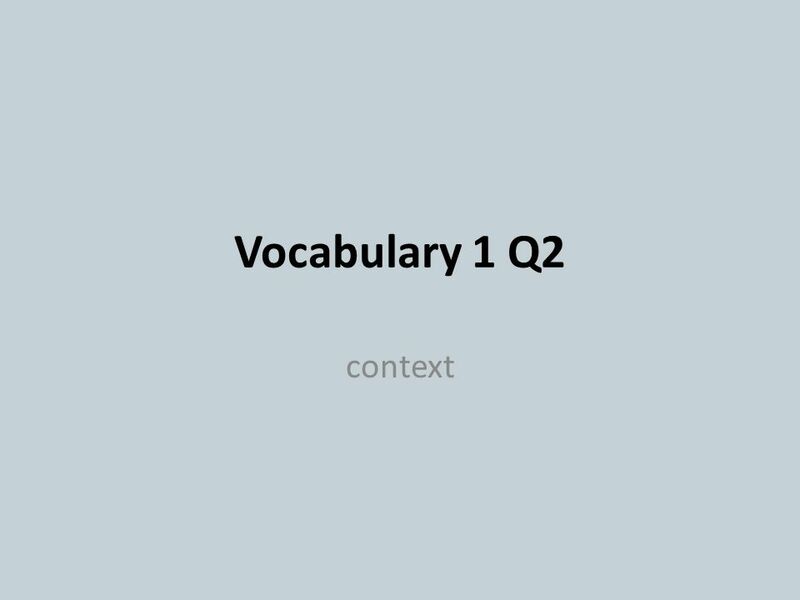 Download ppt "Vocabulary 1 Q2 context. Standard ELACC8L4: Determine or clarify the meaning of unknown and multiple-meaning words or phrases based on grade 8 reading." Vocabulary Making New Words Your Own By Kathy Adams. The Café Book Literacy Café Menu C-Comprehension A-Accuracy F-Fluency E-Expanded Vocabulary. Vocabulary List 2 Q1 Palate, Partake, Delectable, Unsavory, Sustainable, Derision, Resolute, Gingerly, Transgression, Distorted. Vocabulary List 2 Q1 Palate, Partake, Delectable, Unsavory, Sustainable. Vocabulary Lesson 1 Q2 Context Clues. Standards ELACC8RL4: Determine the meaning of words and phrases as they are used in a text, including connotative. Vocabulary Lesson 2 Q2 Context Clues. Standards ELACC8RL4: Determine the meaning of words and phrases as they are used in a text, including connotative. E05.B-V.4.1.1: Determine or clarify the meaning of unknown and multiple- meaning words and phrases based on grade 5 reading and content, choosing flexibly. Supporting Reading Comprehension at Home Presented by Megan Breakwell Smith & Elisa Berhaupt Created by Elisa Berhaupt and Megan Breakwell Smith. Finding Context Clues What are they? Why do they matter? English Word Origins Grade 3 Middle School (US 9 th Grade) Advanced English Pablo Sherman The etymology of language. Word Bertie Middle School By Carol Mizelle Gonzalo Pitpit.